For the days when we’re feeling athletic but don’t necessarily want to spend an entire day on a hot golf course, we head to TopGolf. 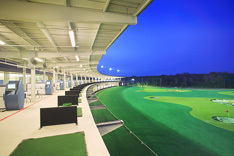 It’s your typical driving range, just a little more juiced up. Each ball has a sensor in it, so you can keep score among your group to see who is actually doing a good job. Food and drinks (yes, alcoholic) are also part of the fun.